As warmer weather approaches, we prepare ourselves for the sun’s rays by getting our swimming pools ready for the summer. But swimming pools aren’t just for daylight hours. Some of our most enjoyable pool parties happen at night! LED lighting not only provides safety but can create amazing aquatic experiences you & your friends or family will never forget. LED lights also illuminate the outside of your pool providing a light that softens and enhances the area around your pool. 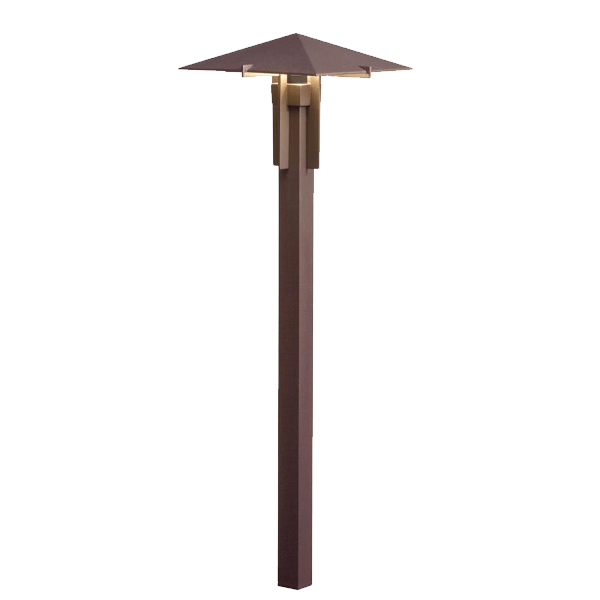 Install them so that they shine on the trees around your pool to add a structural element to your design. Outside LED lighting will draw your guests to the pool area with the ambiance that you’ve created. Light the pathways and other landscaping to allow your guess to move around the pool safely. Here are some LED light fixtures that you can use on your pool deck to enhance and customize the overall outdoor pool experience. These light fixtures hide underneath the handrails of your steps and cast a faint glow that lights up the spaces between the balusters. Without sacrificing the beauty of your design these lights illuminate the stairs with just enough light so that your friends can maneuver around safely while carrying plates of food and drinks. When people try to move around in the dark, they are too busy concentrating on trying not to trip which definitely decreases the fun factor. These lights recess into the deck floor so that their surface is flush with your deck. 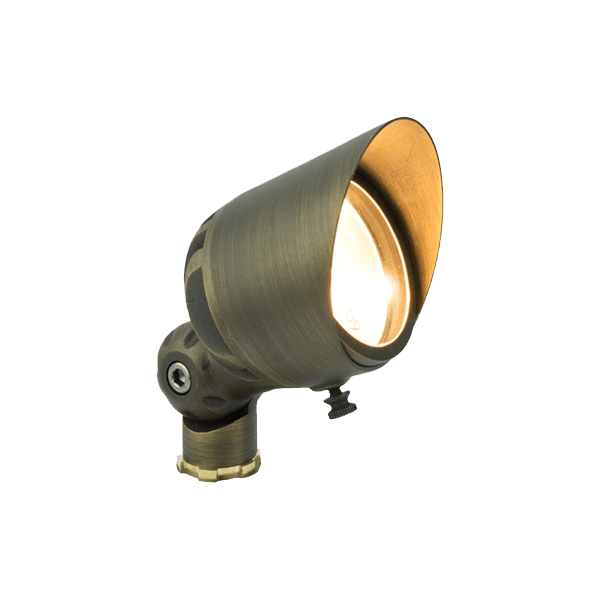 They allow you to light areas that you usually couldn’t because raised lights would be tripping hazards. 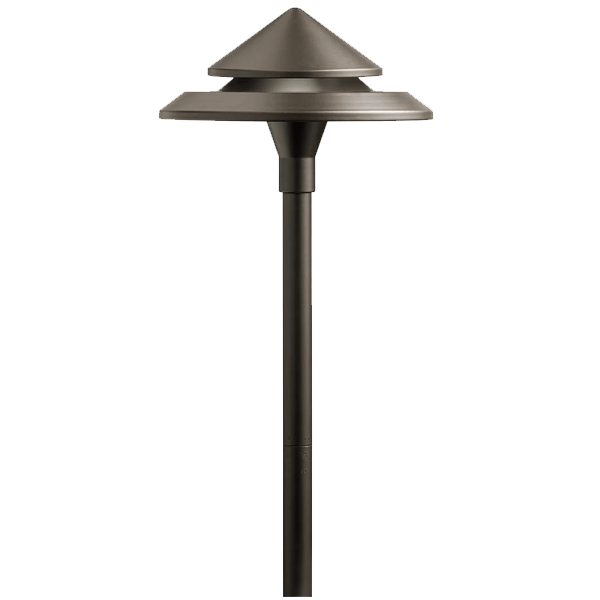 Place LED lights on the side of your posts and fence to cast a subtle, downward glow to illuminate dark spaces. They aren’t too harsh or bright and won’t shine in your eyes. Install these lights under post caps to softly brighten and warm the atmosphere. 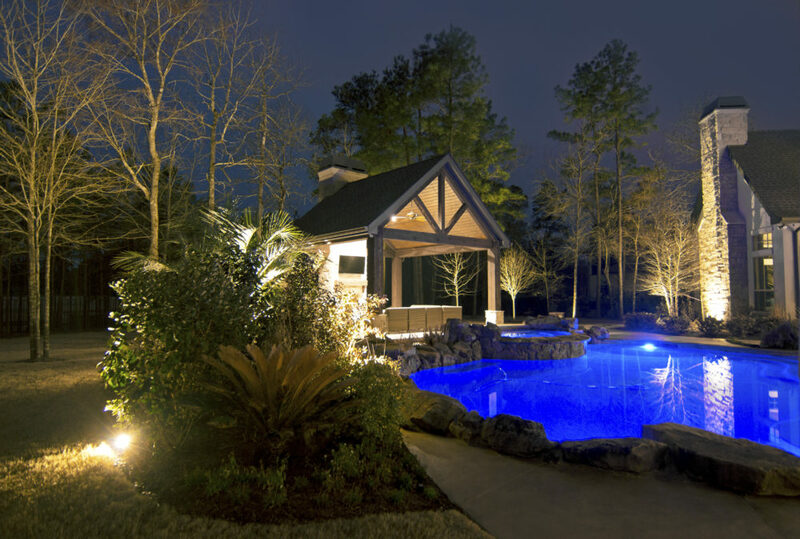 These lights are one of the most common lighting applications for your pool deck. You may find that these lights detract from the scenery when people sit down because this often puts the lights at eye level. 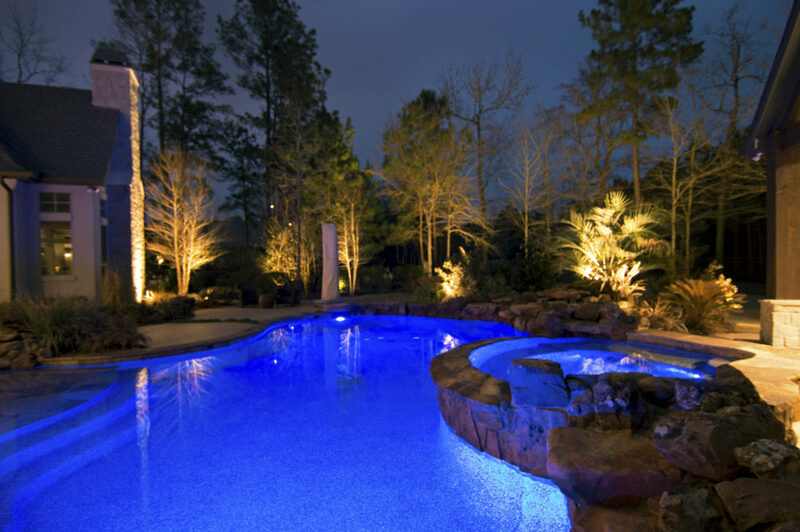 Enhance the ambiance of your pool and outside landscape with LED lights. They highlight your favorite structural aspects and impress your guests with customized colors and styles. 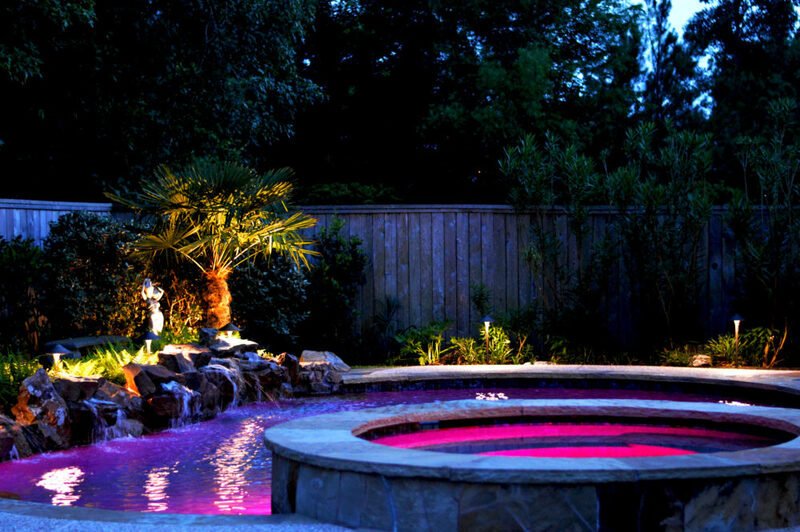 Make your pool the star feature of parties at night as well as during the day. 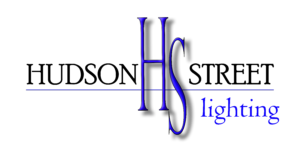 For home owners, home builders & real estate professionals – how having low voltage lighting can help sell your home. When selling your home, it’s vital to downplay any weaknesses and highlight your home’s best features. Many people think that landscaping and enhancing curb appeal isn’t necessary, but in this case, first impressions are everything. You may think that landscape lighting won’t add to your house’s curb appeal. However, landscape lighting design enhances structural details and softly illuminates your home providing a warm ambiance. 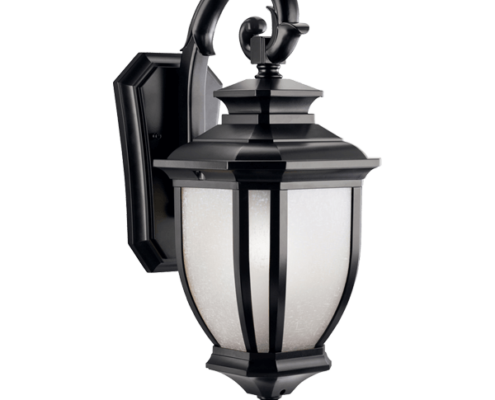 Soft exterior low volt led lighting can increase the value of your home. 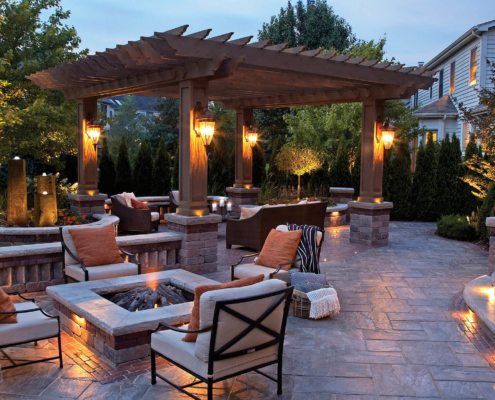 Few investments bring you 100 percent ROI, but landscape lighting sure comes close. Lighting can be everything so let’s learn how to use it to our advantage. 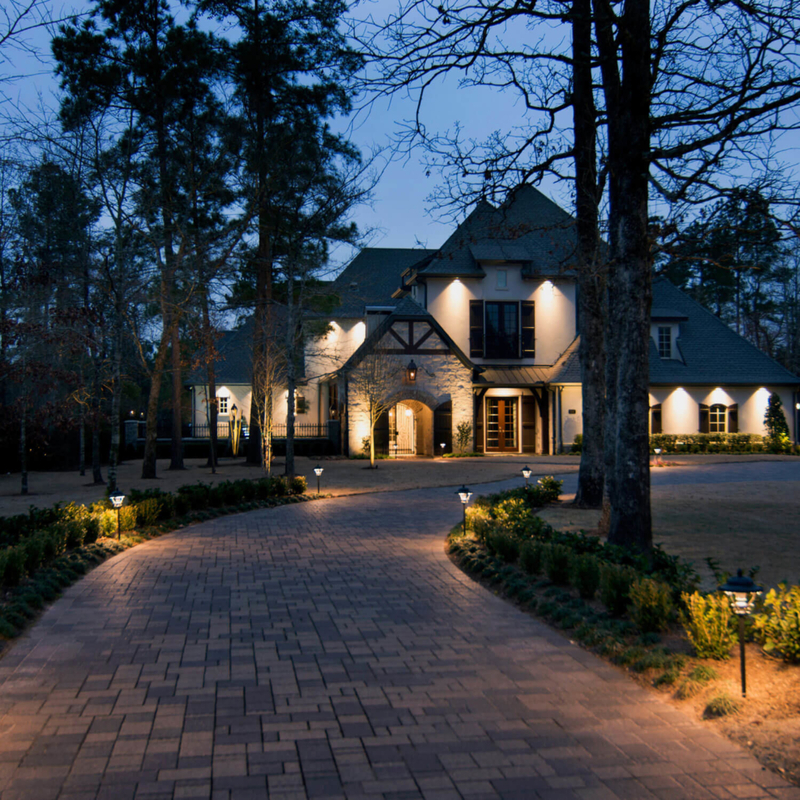 If you have a beautifully detailed walkway, light it up to draw the attention of potential buyers. 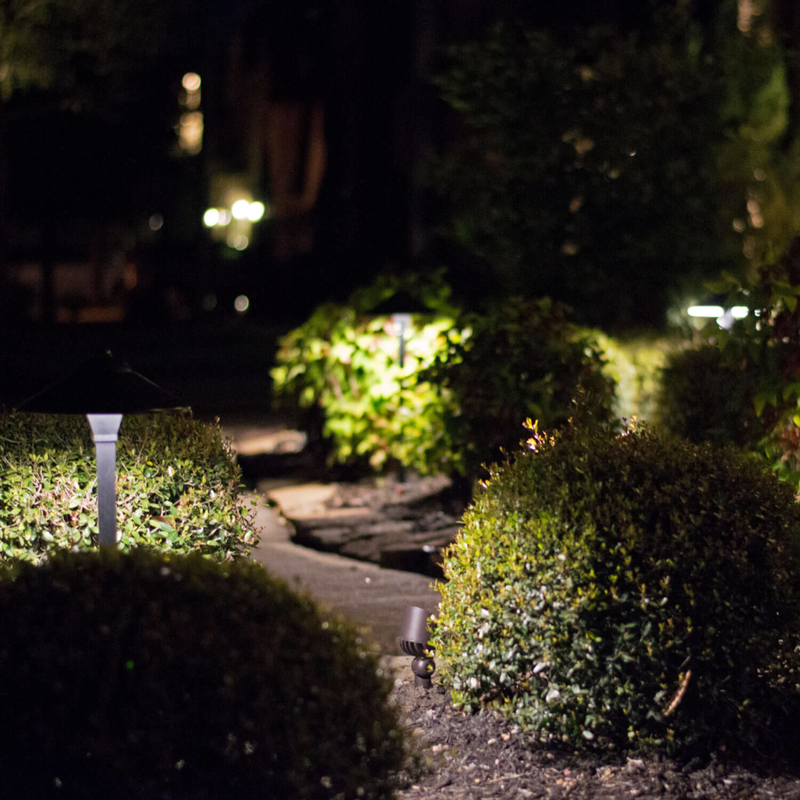 Use landscape lighting to cast soft light on hedges, plants, and a beautiful yard. People coming and going from nighttime open houses will picture themselves having family gatherings and parties with friends. Subtle lighting creates a unique experience for people who visit your home, especially for those interested in buying it. It can provide a feeling of comfort and warmth that people may not realize is a simple landscape lighting design. Highlight architectural details with uplights. Up-lighting cast light up towards walls and pillars accentuating them with shadows and light. You can also use the right amount of light to silhouette other features of your landscape such as statues or shrubbery. 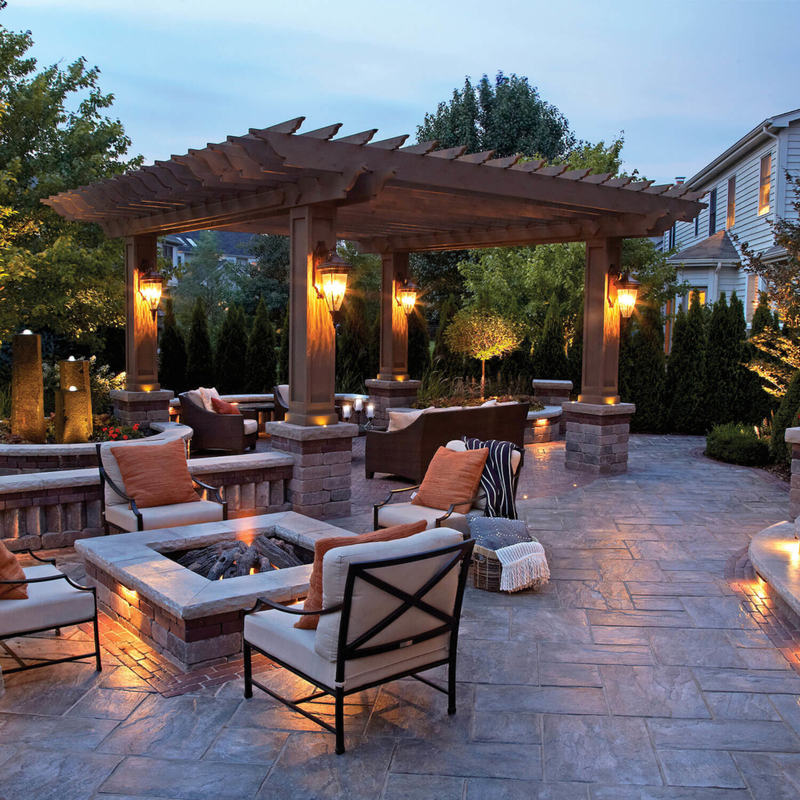 Light and shadow create focal points in your yard and around your house and increases visual interest for visitors. You can also install lights high up on your house or in trees that cast light down, simulating moonlight. 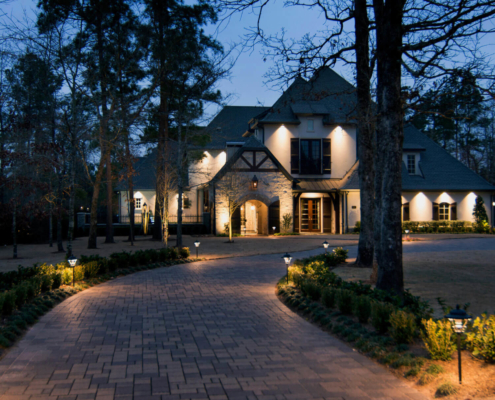 This lighting helps guide people through your property and to the front door. If you have a unique door, you can highlight it with subtle lighting making it a showpiece for interested buyers. 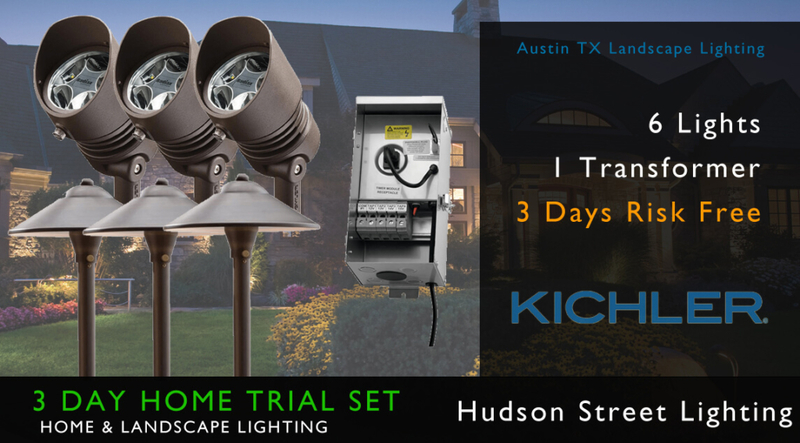 Numerous studies have illustrated that most homeowners prefer a house with a customized, well-designed landscape lighting system. These systems can increase your property value up to 20 percent. 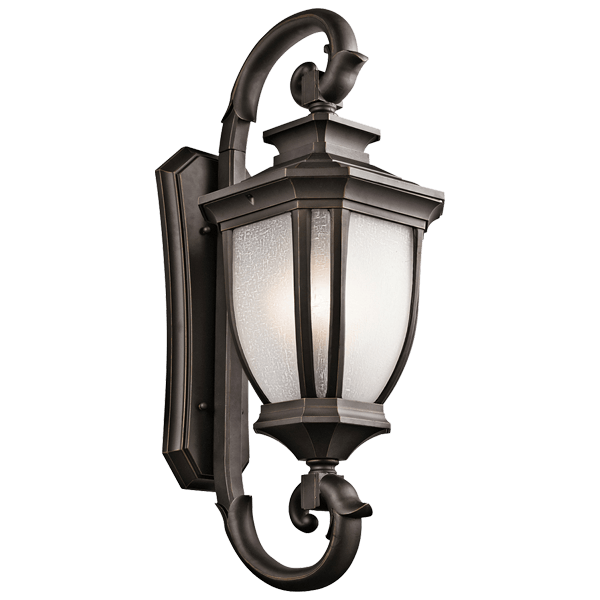 The National Association of Home Builders conducted a survey that showed 90 percent of home buyers found outside lighting one of the most desirable exterior features of a house. Imagine the open house set in the evening time, just before the sun goes down. 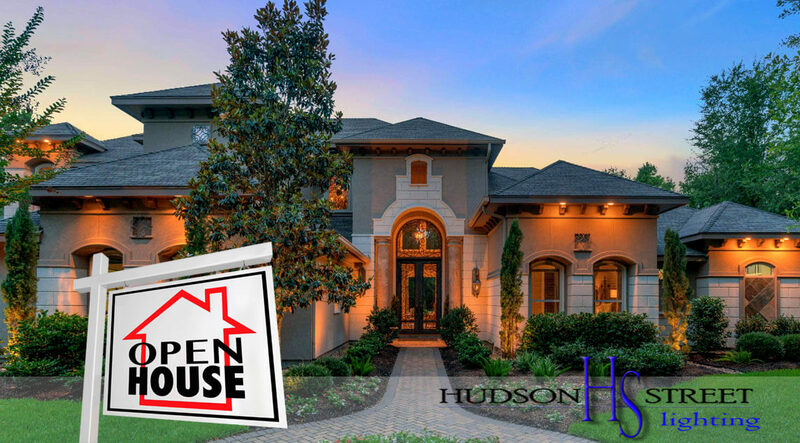 Potential buyers attending an open house when they get to see the home as the sun goes down can have dramatic emotional effect and may drive compelling offers for the home. Help your realty agent by making your home look it’s best! When you include for sale property photos during dusk when the lighting system comes on for the night, you can get some excellent photos that potential home buyers will fall in love with. 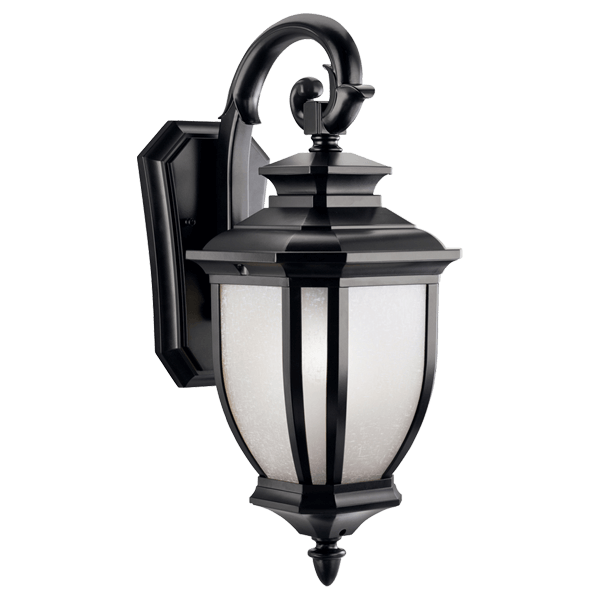 Exterior residential lighting serves other purposes than just enhancing aesthetics. The FBI reported that there were approximately 1,401,840 homes burglarized in 2017. 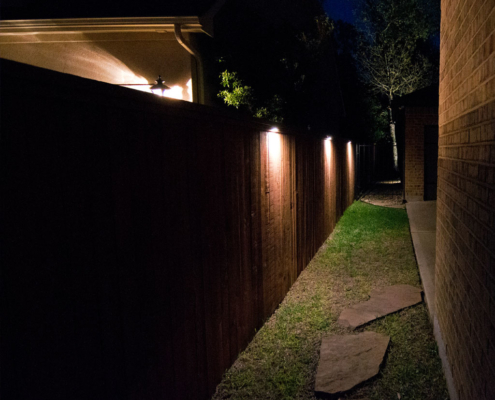 Homes with landscape lighting deter criminals because they are more difficult to break into without detection. Criminals look for places to hide such as dark places near tall shrubbery or areas with obstructed sightlines. 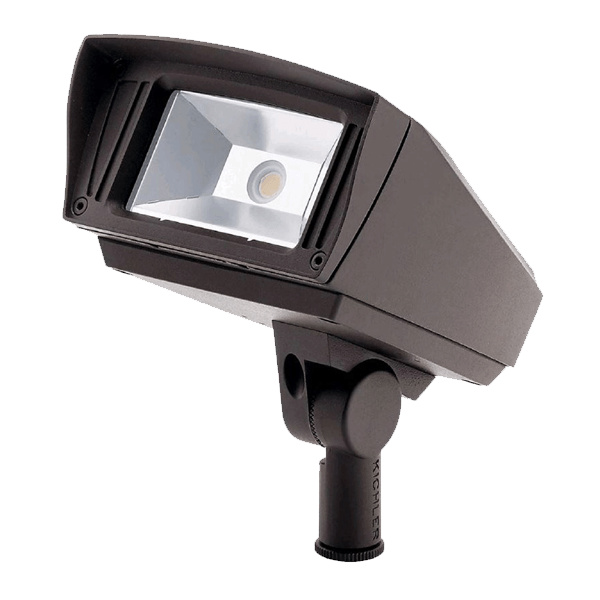 Installing motion detectors along with landscape lighting is an excellent component of any security plan. 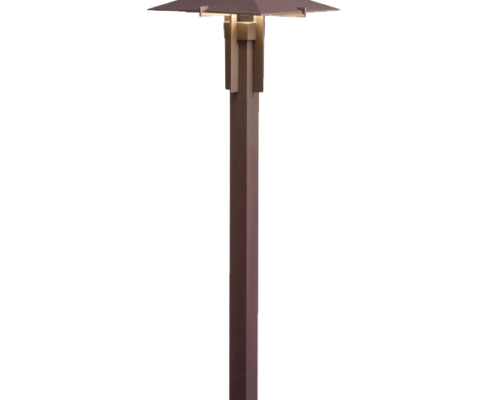 Light up your yard or other buildings on your property such as gazebos, garages, or sheds. 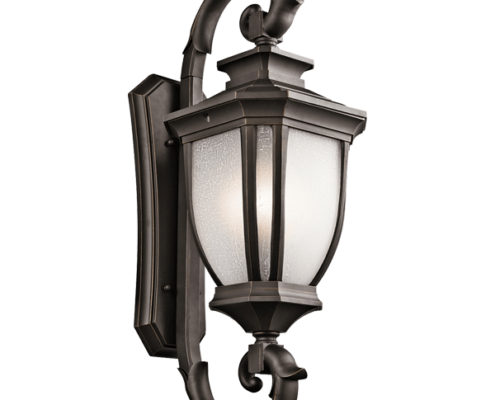 Proper lighting also highlights the beauty of architectural features of your home while helping visitors traverse your property safely. You may know where the hazards are, but guests may trip over plants, decking, or other obstructions. Soft lighting illuminates stairs or other drop-offs such as the end of your deck as well. 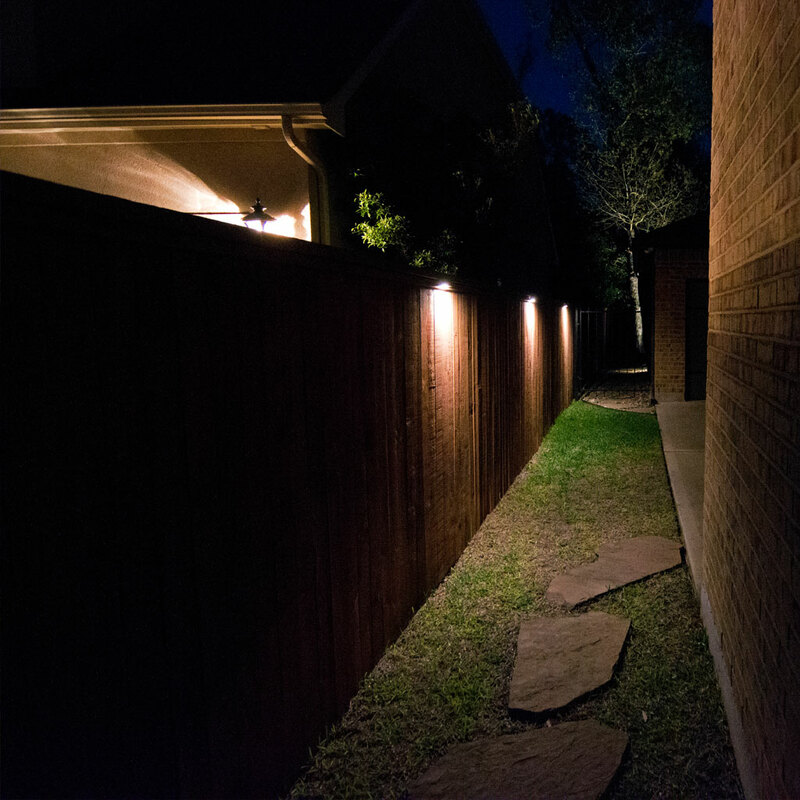 Outdoor lighting also makes your property safer for guests when they are coming or going. Homeowners appreciate the forethought that goes into creating a safe home environment. That’s why landscape lighting ranks so high on the list of needs for home buyers. 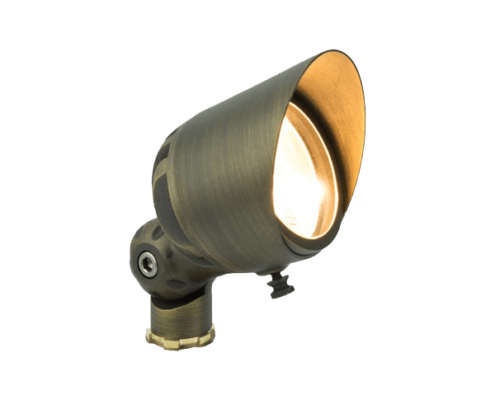 Landscape lighting certainly has a dual purpose. You can craft the perfect balance between enhancing your home’s curb appeal and safety with customized landscape lighting. 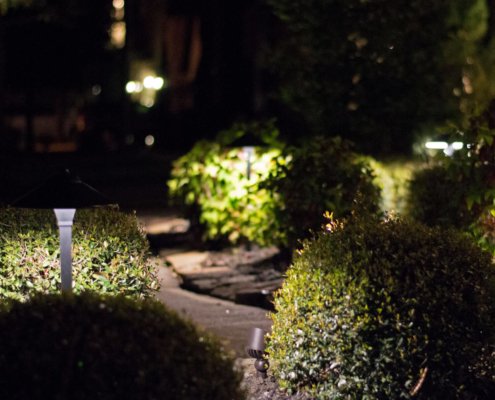 The combination of added safety and a warm ambiance make landscape lighting an excellent option to increase your home’s value. It’s a great investment to improve the curb appeal of your home and make buyers fall in love with the experience that landscape lighting provides. People who buy homes are looking to have as little work to do as possible. 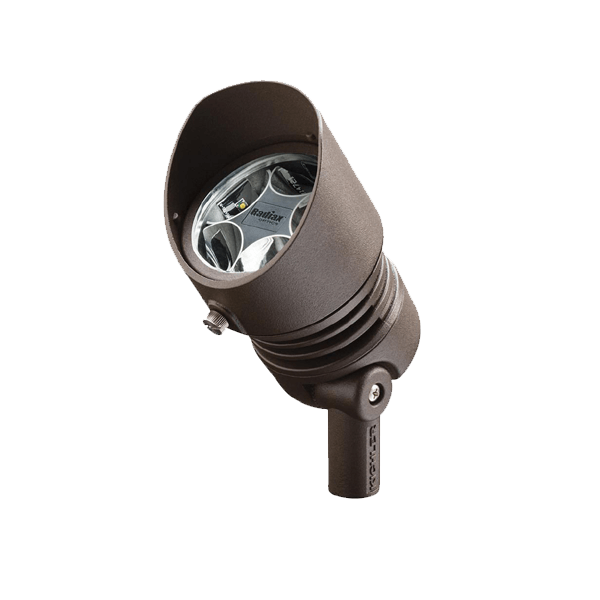 Adding a low voltage landscape lighting system to your home prior to selling is not just another expense, you will get that back when the home is sold. 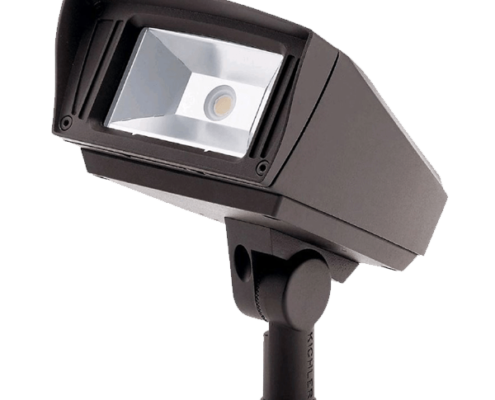 Landscape lighting is an investment to your home value whether you are actively selling or not. The bottom line is, the more inviting and awe inspiring you can make the home look the easier it will be to sell. Don’t let potential home buyers think you cheaped-out if you are one of the few homes on the block without exterior low volt lighting, you wouldn’t want them thinking what else is missing throughout the home! Our low volt lighting systems are so versatile & adaptable that they can even be integrated into your swimming pool digital control automation system! 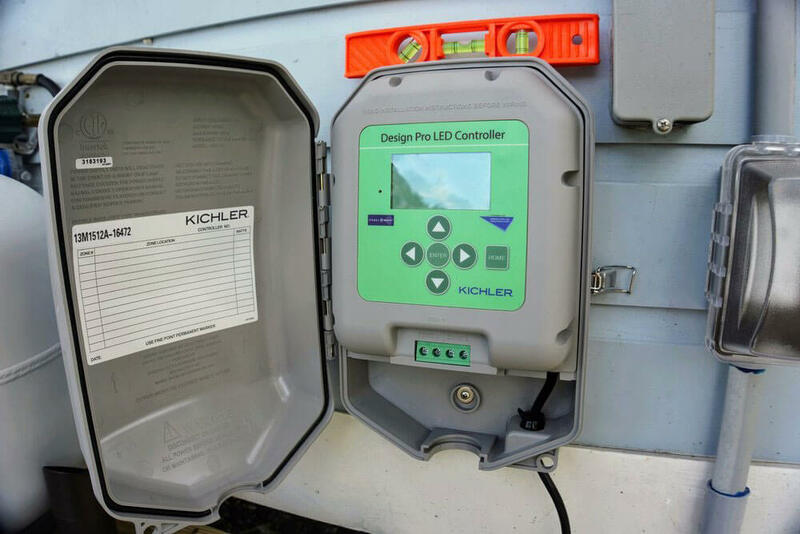 We see that most swimming pools equipment come with digital control centers that have extra features, one of which is the ability to add in backyard landscape lights and have them programmable along with the pool & spa. 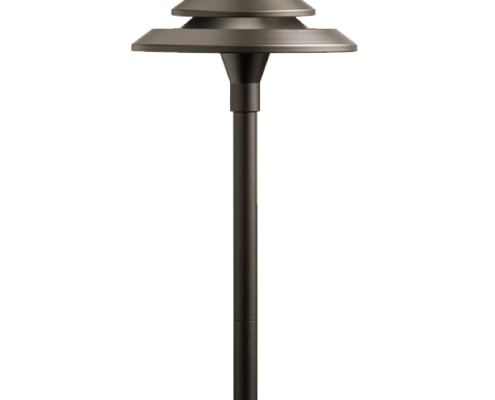 This makes it convenient because all of the backyard features are combined into one system and wireless remote. There are 2 ways that we can power our low volt light transformers via the swimming pool control box. 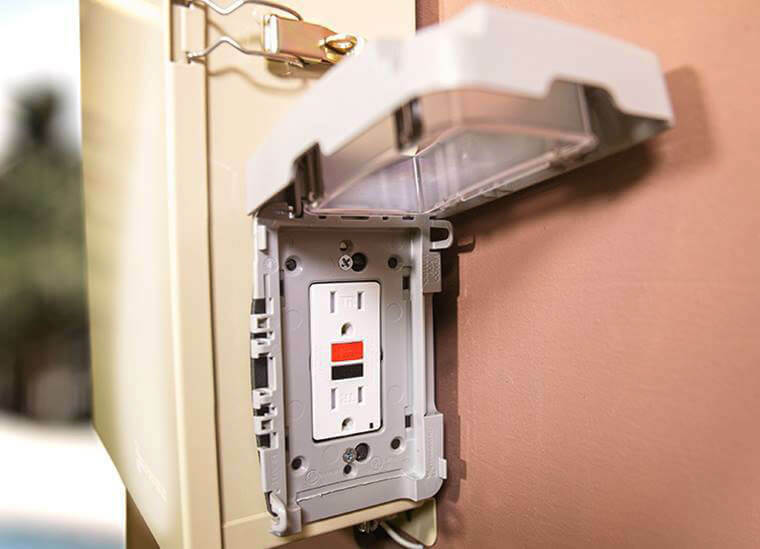 Typically, we find that a local GFCI receptacle is added to the side of the load center (control box) and will suffice, when using a weather protected cover, for plugging our transformer into. Another method, and the most popular, is to power our transformers from an available switch or “relay” within the pool control box. 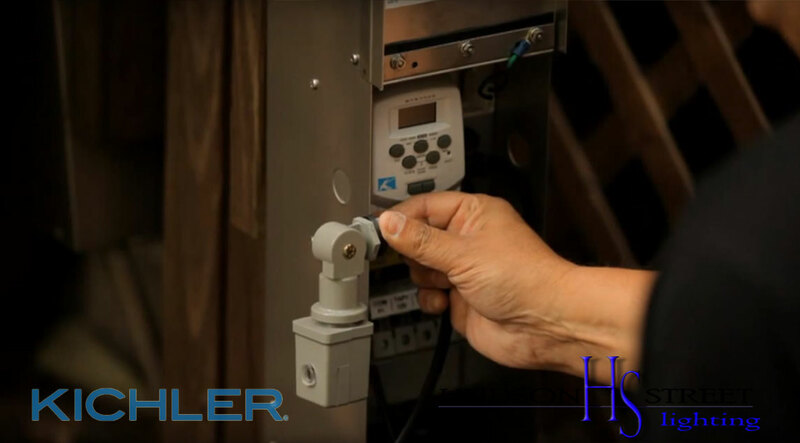 The side mounted GFCI receptacle on a pool & spa controller is generally used as the protected circuit for the swimming pool lighting system, which makes sense for us to adapt for 120 volts of power supply to our landscape lighting transformers. If the system is missing this component and the control box allows for a “knock out” we can easily add the required power receptacle. If the control box is missing this feature yet supports the addition of 120 volt circuit breakers then we can hard wire our transformer to a breaker slot. Note: This method will require a transformer with internal timer, or a photocell switch for automatic functionality. Wiring to an available relay switch is the best way to go if you want the lighting controls together with the pool. It allows for you to program the relay switch for LED landscape lights, assign a schedule, and make manual overrides. 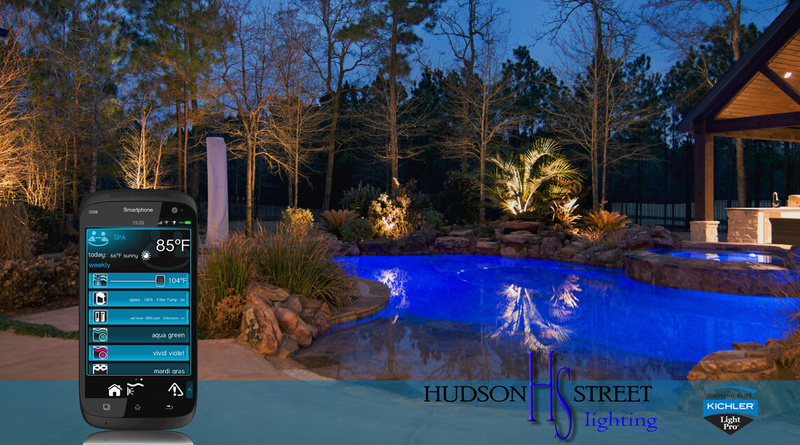 As most swimming pool control systems now support WIFI & mobile connectivity and landscape lights around the pool this all comes together as the most convenient way to enjoy the backyard. Alexa and Echo integration into your pool control will allow you to voice activate your landscape lighting! For simple pool control systems, those featuring rotating dial timers, you can still add in the low voltage transformer, but will not have limited capabilities. 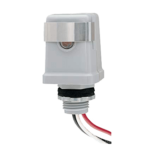 For simple dial controllers we suggest adding a photocell switch, or you may need to add an additional timer specifically for the light system. Through helping so many customers we have learned the installation for the most popular pool control systems installed in the field. What is swimming pool automation? 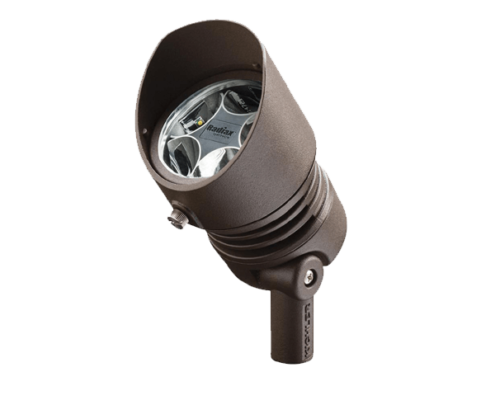 What are the best LED yard lights? We do not promote home owners to make electrical changes to their home, pool, or landscape wiring. The methods listed here apply to trained electrical professionals and low voltage lighting professionals.